I repeat, awesome. This is one of the best toys Fun Pub has ever made. 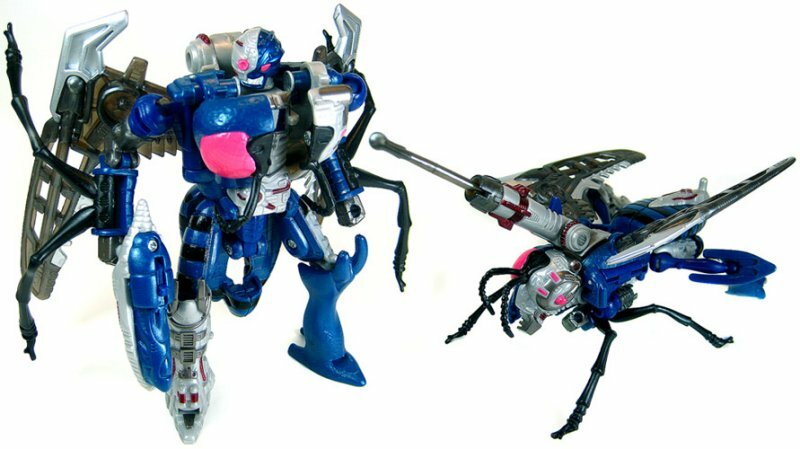 The Cyber Beasts are some of my favorite Beast Wars era toys. 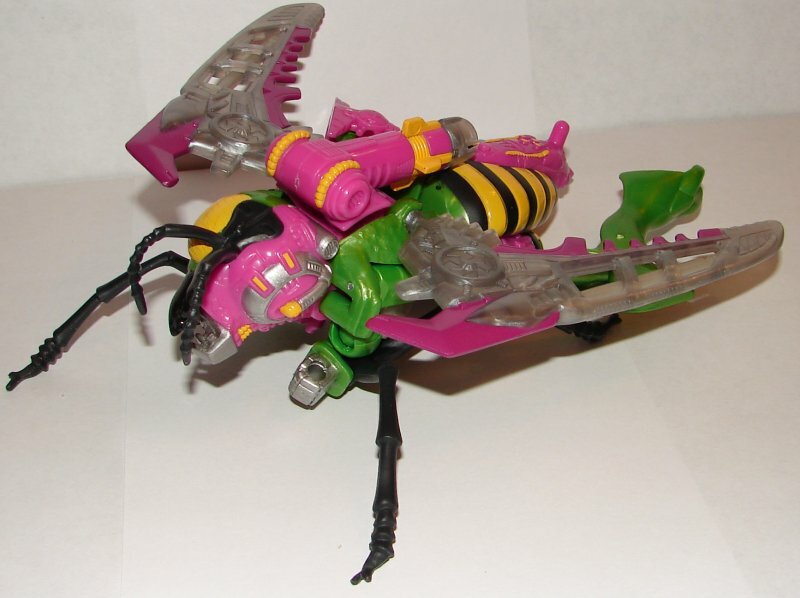 This was the perfect mold for a Waspinator/Thrust hybrid. The new head sculpt looks fantastic and his paint job is amazing. They really did a wonderful job on the colors. The paint apps are fantastic, especially on the robotic/Thrust parts. There was one odd thing. 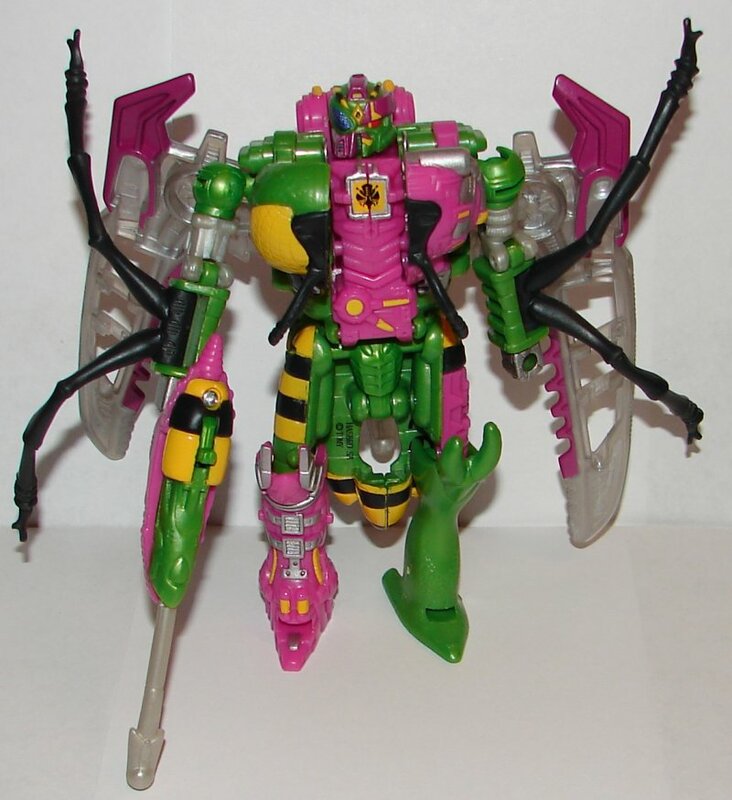 When I (and others, maybe everyone) took Thrustinator out of the box his insect legs were put on upside down. While these parts are not meant to be removed, they do come off and are easily flipped around. Initially I thought this was a factory screw up, but it looks like they might have done it deliberately to fit him better into the box. I’m honestly not sure which it is. 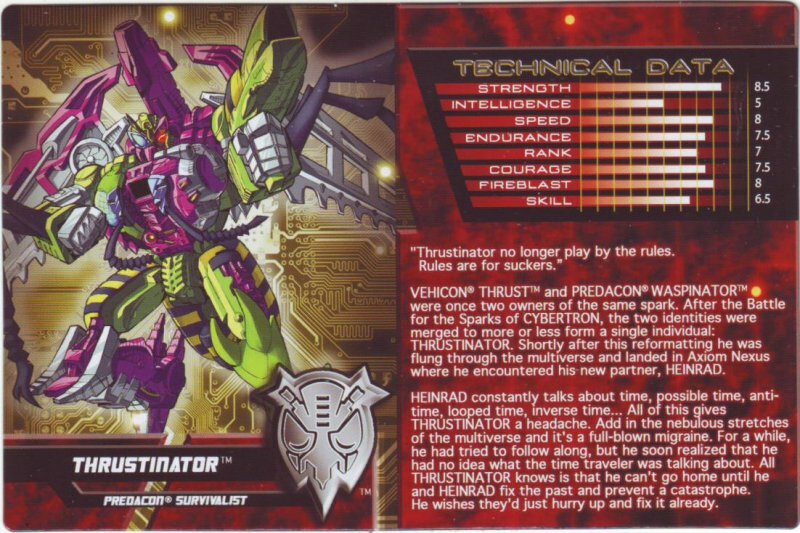 Obviously this is not as bad as this year’s Scorponok, last year’s Megaplex, Hoist, and Electrons, and Gigatron from a few years back, to say nothing of their frequent part swap errors. However, if this was intentional, they should have had a sheet of paper in the box saying that they needed to be flipped around. Better yet, just package him with them unattached. Remember, these are parts that can come off, but are NOT MEANT TO COME OFF. I swapped them right away, and while transforming him they kept popping off. None of my originals ever had the insect legs come off. 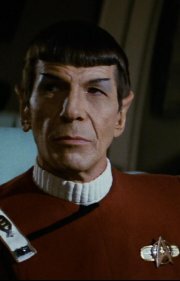 Is that mold degradation? Is it cheap plastic? Is it that you really aren’t meant to take them off and put them back on? My guess is that it’s the latter, because the plastic quality seems fine and the mold has only been used once. It’s not a huge deal, but it’s this kind of thing that makes the high quality of many 3rd party toys preferable to many collectors over Fun Pub’s overpriced offerings. This entry was posted in Toy Reviews, Toys, Transformers and tagged Beast Machines, Beast Wars, Beast Wars 2, Beast Wars II, Botcon, Dirgegun, Subscription Service, Subscription Service 2.0, Subscription Service 2014, Thrust, Thrustinator, Toys, Transformers, Transformers Collectors’ Club, Waspinator. Bookmark the permalink.